Hospital: "Not reporting a gunshot wound is a clear violation of our policies." NEW YORK (CNN) -- A New York hospital worker was suspended for failing to report the gunshot wound of NFL star Plaxico Burress, a hospital spokeswoman told CNN Monday. 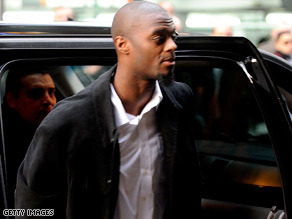 New York Giants receiver Plaxico Burress arrives at the 17th police precinct in Manhattan on Monday. The spokeswoman, Kathy Robinson, gave no further detail on the New York Presbyterian Hospital employee. "We can confirm that the individual at New York Presbyterian Hospital, who was responsible for failing to report the incident, has been suspended," hospital spokeswoman Robinson said. Burress has garnered media attention recently for accidentally shooting himself with a gun he is accused of bringing into a crowded New York night club. New York Mayor Michael Bloomberg slammed Burress on Monday, saying it would be an "outrage" if the Giants receiver isn't prosecuted "to the fullest extent of the law" after the shooting with a gun that authorities say he owned illegally. Burress, 31, was arraigned Monday on two counts of criminal possession of a weapon in the second degree. He could face up to 15 years in prison, the Manhattan district attorney's office said. Alicia Maxey Greene, spokeswoman for the district attorney, said Burress is not expected to enter a plea until a court appearance in March. Burress' attorney, Benjamin Brafman, said he expects Burress to plead not guilty. Bloomberg, speaking at a news conference, made clear he wants Burress to face jail time. Noting a law that automatically sentences an offender to at least 3 1/2 years for illegally carrying a loaded handgun, Bloomberg said, "It's pretty hard to argue the guy didn't have a gun and it wasn't loaded. You've got bullet holes in and out to show that it was there." The mayor also lashed out at New York Presbyterian Hospital for failing to inform police about the incident. He called on the state attorney general to "go after" the hospital for a "chargeable offense." The district attorney's office said the hospital is under investigation. The hospital said it also is investigating the incident and promised to cooperate with authorities. In the incident Friday night, Burress suffered a wound to his right thigh and was treated and released from the hospital, the Giants said in a statement released over the weekend. Sports Illustrated reported that Burress had accidentally shot himself with a gun he was carrying while at Latin Quarter, a sprawling nightclub in Manhattan. Brafman said his client "understands the seriousness of the situation, and he's addressing it in a responsible fashion." Brafman also said Burress is "physically OK and mentally OK." He added that he does not know when Burress may be back on the field. Bloomberg, who has long fought against illegal gun ownership, said public figures "make their living because of their visibility. They are the role models for our kids, and if we don't prosecute them, to the fullest extent of the law, I don't know who on Earth we would. It makes a sham, a mockery of the law." Turning his ire to New York Presbyterian Hospital, which treated Burress, Bloomberg said officials "didn't do what they're legally required to do" -- inform the authorities of the incident. "It's a misdemeanor. It's a chargeable offense, and I think that the district attorney should certainly go after the management of this hospital." He also called on the hospital to fire those whose responsibility it was to alert the authorities. And Bloomberg added, "I would question why the management didn't have training in place and didn't discipline them immediately. It's just an outrage." The hospital later Monday afternoon issued a statement acknowledging that "not reporting a gunshot wound is a clear violation of our policies and procedures." "We take this very seriously, and are conducting a thorough investigation into why this gunshot wound was not reported to the police department in a timely fashion. Appropriate disciplinary action will be taken. We are in full cooperation with the mayor's office and the police department," it said. Bloomberg also complained that the Giants "should have picked up the phone right away as good corporate citizens. I don't care whether there's a legal responsibility for them to do it. They are a team that is here in this region. I know they're in New Jersey, but it's the New York Giants, and they have a responsibility as a team that depends on the public and wants to be role models to the public." The mayor said police learned about the incident from a TV report. But team spokeswoman Pat Hanlon, in an e-mail to CNN, wrote, "We are working closely with the police and NFL security. In the early hours of Saturday morning, as we started to get a sense of what we were dealing with, we did, in fact, notify NFL security, which then contacted the police." Over the weekend, the Giants issued a statement saying they were "in contact with Plaxico since shortly after the incident," and that their primary concern was for his health and well-being. The team said it had contacted NFL security and was working to gather more details. The shooting was the latest bump in a rocky season for Burress, who became a hero of last season's Super Bowl when he caught the game-winning touchdown pass from quarterback Eli Manning with 35 seconds remaining. He was fined and suspended from the team's October 5 game for reportedly missing a practice without notifying the team. Later, he was fined $45,000 by the NFL after an October 19 game during which he argued with a referee and threw a football into the stands. He injured a hamstring in a game two weeks ago and was not scheduled to play in the Giants' game on Sunday. CNN's Laurie Segall, Elianne Friend, Kristen Hammill and Cheryl Robinson contributed.